Today in Masonic History Joseph Bloomfield passed away in 1823. Joseph Bloomfield was an American politician. Bloomfield was born in Woodbridge in the then British Province of New Jersey. Bloomfield's father was a surgeon and abolitionist. Bloom was educated in Reverend Enoch Green's school in Deerfield, New Jersey before going on to study law. He was admitted to the bar in 1775 and began his practice in Burlington, New Jersey. When the American Revolution started, Bloomfield joined the Continental Army as a captain in the 3rd New Jersey Regiment in February of 1776. 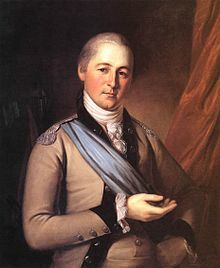 In late 1776 he was promoted to major and made the advocate of the Northern army. In 1777 he was wounded at the Battle of Brandywine. He resigned his commission the following year in 1778 when he was elected clerk of the New Jersey General Assembly. From 1779 until 1783, Bloomfield practiced law in Burlington, New Jersey. In 1783 he became the New Jersey Attorney General serving until 1792. In 1793 he became a trustee of Princeton College, serving until the time of his passing. In 1794, Bloomfield was given command of Federal and New Jersey state troops to help put down the Whiskey Rebellion, a popular uprising conducted by Appalachian settlers who resisted the excise tax on liquor and distilled drinks. After returning from the Whiskey Rebellion in 1795, Bloomfield became the Mayor of Burlington New Jersey serving until 1800. In 1801, Bloomfield was elected as the 4th Governor of New Jersey. He was elected as a Democratic-Republican. He served from 1801 until 1812 with a gap from October 1802 to October 1803, when John Lambert was acting Governor of New Jersey. The gap in Bloomfield time as Governor came when in 1802 the election for Governor was deadlocked and the Legislature could not pick a candidate. Because of this John Lambert, who was the vice-president of the Legislative Council was made the acting Governor until the next election in October 1803. When the War of 1812 started, Bloomfield was called up again, this time as a brigadier general. He served along the United States and Canadian border. In 1817, Bloomfield began serving in the United States House of Representatives for New Jersey's at-large seat. He was reelected once, serving until 1821. He failed to in his second attempt for reelection. Bloomfield passed away on October 3rd, 1823. Bloomfield was a member of Bristol Lodge No. 25 Bristol, Pennsylvania where he was raised and served as Worshipful Master. In 1790 he affiliated with Trenton Lodge No. 5 in Trenton, New Jersey. From 1799 to 1800 he served as the Most Worshipful Grand Master of the Grand Lodge of New Jersey.